So I’ve been on a little blogging hiatus for the past couple of weeks because I’ve been being a busy bee in the real world, including completing my uni degree (! ), running a half marathon and running off to Greece for some sunshine. So let me backtrack to the end of May when I was in Edinburgh to complete a big ol’ run. If you’ve known me for a while, you will know that a couple of years ago, exercising wasn’t, shall we say, my strong point. I was that “I can’t do it” person, and when it comes to moving your body, “I can’t do it” simply means “I don’t want to try”. But one day, my mum motivated me to get off my lazy bum and start enjoying exercise for the sake of my health. What I love about fitness is the slow and steady improvement, because sure, to start with I couldn’t run for 5 kilometres without stopping at least every 5 minutes to catch my breath – but now I’ve just completed my first half marathon (21.1km!). This doesn’t happen as if by magic, but because you yourself have put in the effort – no matter how slow I was, the more I kept running, the easier it eventually became. Together, as a family, we completed the full marathon distance as a relay team at the Edinburgh Marathon Festival in 2015, which was a fantastic experience. So I was incredibly proud this year when I was able to run 13.1 miles of the half marathon myself along the beautiful beaches of the east coast of Scotland. Running in my “Eat Veggies Not Animals” t-shirt, I was spurred on by the sight of other Vegan Runners along the way as we all raced to prove that plants are the only fuel we need. Sold as “flat & fast” the scenic Edinburgh marathon route is ideal for first timers. It’s also good to keep in mind that the route was never too crowded; there was always plenty of space to go at your own pace which makes it perfect for those looking to ace a personal best! 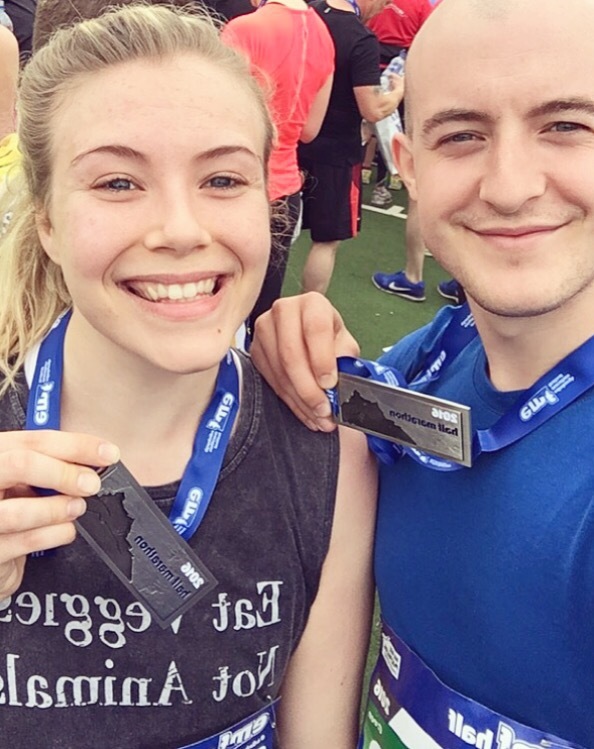 I was proud of my achievement, but I also know that I’m capable of training harder and running faster, so I’m keen to get my next half marathon lined up – it still feels strange to realise that a half marathon is something to look forward to and not to dread!